Feb. 9 (UPI) — Immediately after his attorney general was sworn in Thursday, President Donald Trump issued three new executive orders outlining his criminal justice priorities — to prosecute criminals, protect law enforcement officers and ensure the safety of U.S. citizens. “I’m signing three executive actions today designed to restore safety in America,” Trump said during the swearing-in ceremony for Attorney General Jeff Sessions. This executive order submits Trump’s policy to reduce crime in the United States. “A focus on law and order and the safety and security of the American people requires a commitment to enforcing the law and developing policies that comprehensively address illegal immigration, drug trafficking, and violent crime,” the order states. The action directs Sessions to establish a temporary task force that will share information among agencies, develop strategies, identify deficiencies in current laws, evaluate criminal data and make recommendations. The task force must present a report to Trump once a year for as long as it exists. This order outlines the administration’s intent to crack down on foreign-based crime — particularly drug and human trafficking. 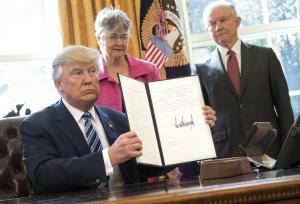 The action calls for stricter enforcement of laws already on the books, and for federal agencies to give high priority to and allocate sufficient resources to “identify, interdict, disrupt, and dismantle transnational criminal organizations.” It also calls for greater sharing of information and enhanced cooperation with foreign agencies. Under the order, the Threat Mitigation Working Group will be co-chaired by the secretary of state, attorney general, secretary of homeland security, and the national intelligence director. Trump issued this order in response to an increase in attacks on police officers in recent years. It calls for enhanced protection of federal, state, tribal, and local law officers. The order also asks for new legislation to “define new federal crimes, and increase penalties for existing federal crimes” — and evaluate current laws and grant funding programs in the Justice Department to determine how well they ensure officers’ safety. “We’ll deploy the talents and abilities of the Department of Justice to confront this rise in crime and protect the people of our country,” Sessions said Thursday.